To show to all, that in all familiar things, even in those which are repellant on the surface, there is Romance enough, if we will find it out:- to teach the hardest workers at this whirling wheel of toil, that their lot is not necessarily a moody, brutal fact, excluded from the sympathies and graces of imagination; to bring the greater and the lesser in degree, together, upon that wide field, and mutually dispose them to a better acquaintance and a kinder understanding – is one main object of our Household Words. Dickens’s language is that of the fairy tale, describing an enchanted world full of animated things. It is partly whimsical, a conceit that positions himself as storyteller, telling tales that bring things to life. But there is also a telling ambiguity here. In finding out this concealed ‘Romance’, Dickens implies that it is already there, disavowing his own agency as a narrator as he merely gives it expression. Questions of agency run throughout this passage. If the ‘mightier inventions of this age’ have souls, then have these also been invented? If so, who was the creator: the inventors of these icons of industry? Or the narrator, whose tales grant them life? More troublingly, maybe these ‘swart giants’ have become alive of their own accord and now reckon themselves among the storytellers of the world? Dickens has a great deal at stake here. To ‘show it all’, Dickens requires the cooperation of his mediating object, Household Words. Despite his own remarkable energy and penchant for the stage, Dickens primarily relied upon printed objects to speak on his behalf. As his well-known involvement in the intellectual property debates of his day demonstrate, Dickens took a keen interest in the way his words were mediated. Dickens might have considered himself the originary source of the tales he told, yet by whimsically attributing souls to the products of the industrial age he nonetheless acknowledged that this might not be quite the case. In no other writer of the period is the object-world more alive; and in no other writer of the period are the boundaries between human and object less defined. Like railroads and steamboats, Household Words was also a product of the industrial age and so it, too, Dickens implies, might have a soul. In his whimsical introduction to his own mediating object, Household Words, Dickens both imagines himself as passive media, passing on messages from the world around him, while recognizing that he, too, is a product of the mediating objects that he pressed into service. Just as these emblems of the industrial age trust Dickens to give their stories form, so Dickens trusts to Household Words. I do not really believe that Dickens thought that objects were alive and I recognize there is a difference between Dickens taking inspiration from the world around him and the way he chooses to represent both this world and himself in his periodical. Nonetheless, there is in Dickens a sustained examination of the role of objects and the way that they mediate relationships between people. In this series of posts I want to explore some of the ways that print objects were disciplined so that they could function as media. My argument is that nineteenth-century print culture imposed a set of mediating forms with their own distinct features that, in turn, affected the way that people related to one another. There will be four further posts. I the next, I pick up on Dickens’s ‘whirling wheel of toil’ to examine how repetition can create flow. The steam engine – one of the master signs of the period – translates heat into repetitive motion. When used to turn a wheel, this repetitive motion is made continuous, providing a constant force that can drive other machines or, in the case of the steam train, provide motive force for itself. Although it long predates the industrial age, print embodies its repetitive logic, producing copies of an impression that, if made on an appropriate medium, could circulate widely. Of all print forms, periodicals and newspapers – print genres defined by repetition – embody the logic of industrial print most closely. Through an examination of repetition, I will argue that the recurrent forms of periodicals and newspapers – those formal aspects that are common to all issues of a particular title – help to establish the separateness of content, allowing it to flow. 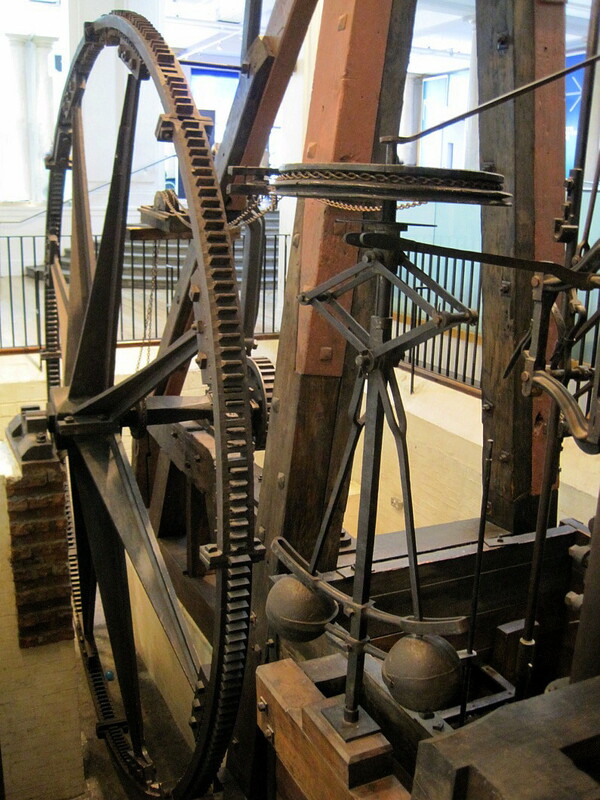 A Boulton and Watt engine (1788), by Snapshooter46 via Flickr under a CC BY SA-NC license. Available here. The steam engine was not just a way of mediating energy, converting heat into motion, but it was also self-governing. The invention of the ‘governor’, the spinning mechanism that regulated pressure in the boiler, meant that the steam engine was able to monitor its own performance and react accordingly. While it granted steam engines a degree of autonomy and provided a useful metaphor for other self-regulating systems (society for instance), it also implied that the engine was something that needed supervision. The boiler explosion was one of the most dramatic examples of a common phenomenon: that we tend to notice objects when they misbehave. In my second post, ‘Things that Move’, I consider what happens when mediating objects – train and telegraph, newspaper and periodical, author and narrator – do not function quite as they should, producing new and unexpected connections between people, living and dead. If the steam engine suggests one way in which repetition and circulation were connected, the heart suggests another. The third post, ‘Being Moved’, examines the ‘many moving lessons of compassion and consideration’ that Dickens promises to tell. As Peter Brooks has argued, narratives make use of desire to drive the reader on towards their conclusion.2 Yet narrative is also a form of repetition, a way of storing up and transmitting stories so that they remain the same despite differences in telling. Brooks claims that the nineteenth-century novel differed from its predecessors in that it takes ambition, the desire to get ahead, seriously. Yet in the repetition of narrative, this getting ahead is constantly thwarted. Serials such as periodicals and newspapers mediate between the desire to move on and the desire for stasis, establishing a perpetual present that is nonetheless designed to pass. Whirling wheels and moving lessons, the steam engine and the heart: this series of posts argues that until we take repetition seriously we cannot really understand the print culture of the past. In literary studies, our usual way of dealing with repetition, with things coming back, is through the gothic and each of my posts draws upon this tradition to account for repetition’s various cultural effects. Throughout, my focus is on the way mediating form posits content that apparently derives from elsewhere. In a sort of repetition of my own, I will keep coming back to Mugby Junction, Dickens’s Christmas issue of All the Year Round from 1866. The frame narrative tells the story of Barbox Brothers, who haunts Mugby Junction as he does not know which line to take. In these posts I argue that Barbox’s decision to stay is similar to the way periodicals like Household Words and All the Year Round mediate through repetition. Just as Barbox Brothers moves on by becoming part of Mugby, so the Christmas number of All the Year Round becomes part of the archive, part of a space called the past, on the appearance of the January number.